With reports of incendiary artillery rounds being used by the Syrian army, and more videos of incendiary cluster bombs emerging it seems the pro-Assad slogan of "Assad or Syrian burns" might be turning into more than just a something shouted at pro-government rallies. Update December 23rd Nic Jensen-Jones has put together this excellent post examining the payload of these bombs that's well worth a read. 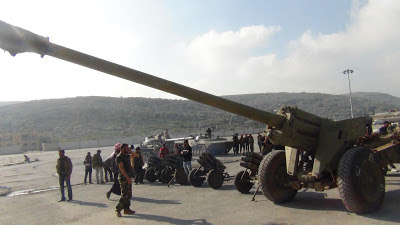 As I've been posting for the last few days a recent major victory at the 46th Regiment base near Aleppo has resulted in large numbers of heavy weapons being captured by the Syrian opposition, including surface to air missiles, tanks, and artillery. 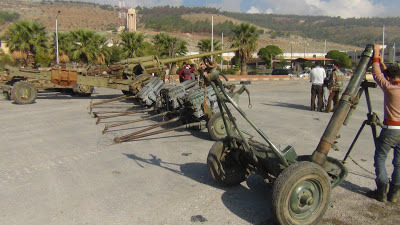 Now more photographs and videos have been posted online showing a large collection of heavy weapons that are claimed to have been captured from the 46th Regiment base. In this first video we at first see, from right to left, a T-55 tank, a BMP-1, what I believe is a BMP variant, and three more tank, possibly T-55s. We then see 6 truck mounted guns, including ZPU-2s, DShKs, and KPVs, likely used in the attack rather than captured from the base. First we see a 130 mm M-46 field artillery gun, then three D-30 howitzers, which I gave more details on in an earlier post. HamaEcho posted a number of photographs showing even more equipment, apparently taken at the same gathering. In this first picture we get another look at the 130mm M-46 field artillery gun, along with four Type-63 multiple rocket launcher, a weapon that until now was the longest ranged artillery weapon widely available to the Syrian opposition (see here for more details of their past use). This photo provides us with another angle on the various collected artillery pieces. It's difficult to get a sense of whether or not they filmed additional vehicles and weapons, but at one point a BTR-60 or BTR-70 is visible in the background. 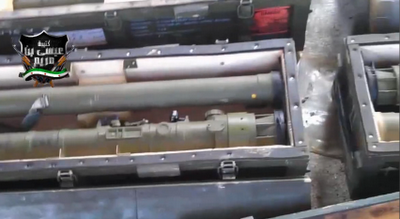 It should be noted one earlier video showed six Type-63 launchers, and there's no sign of the surface to air missiles captured, so it seems unlikely this shows off every heavy weapon captured. At 3:26 we see two T-55 tanks, one of which we see later loaded onto a truck, ready to be transported out of the base. We also see plenty of abandoned trucks, as well as the same BTR-60 I highlighted in this earlier video. It begins with a T-55 tank, then shows a D-30 howizter, followed by a 130 mm M-46 field artillery gun, and a second D-30 howitzer. The D-30 howitzer has an effective range of 15.4km, 21.9km with a rocket assisted projectile; and the M-46 field artillery has a range of between 27.5km to 38km with a rocket assisted projectile. 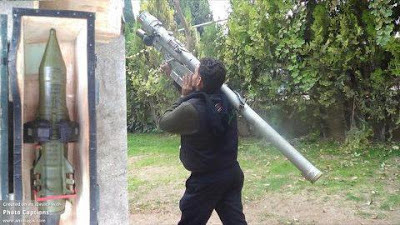 Compared to the range of the Syrian opposition most recently used long range weapon, the Type-63 multiple rocket launcher with a 8.05km range, it's clear this would be a significant improvement in the range of heavy weapons used by the Syrian opposition. 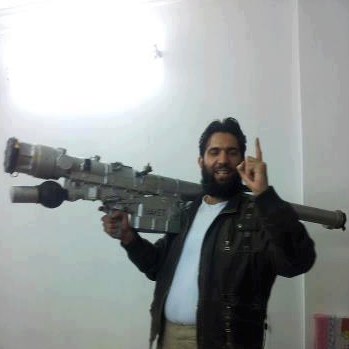 The question is whether or not the Syrian opposition has members who can use these weapons accurately and effectively. We might see these weapons making an appearance soon at another key battle being fought at the Sheikh Suleiman army base, 15km north of the 46th Regiment base. Covering around 200 hectares of rocky hills 25km west of Aleppo the Syrian opposition claims "The day Sheikh Suleiman falls, all of western Aleppo will finally be liberated. Give it 45 days and Aleppo city will fall too", and with the 46th Regiment base captured after a lengthy siege freeing up it's attackers to join the battle at Sheikh Suleiman with their freshly acquired heavy weapons it seems as if this may not be an idle boast. 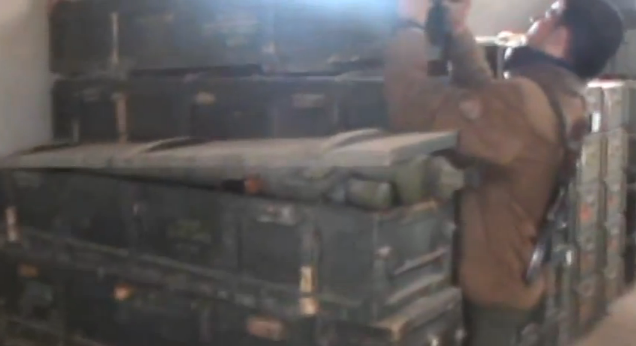 Here we not only have a demonstration of how to put together a SA-7 MANPADS for other members of the Syrian opposition who might have looted SA-7s elsewhere, but evidence that at least one pair of SA-7 MANPADS that they cliam to have looted from the 46th Regiment base, and with 10 crates in those stacks, minus one containing the SA-16 system, that could mean up to 18 complete SA-7 MANPADS. The most important thing here is the presence of the grip-stock. Usually shipped separately they are often the key missing component from looted surface to air missile systems, but unlike the batteries they can be reused, so only one is needed to make all the missiles and batteries usable. 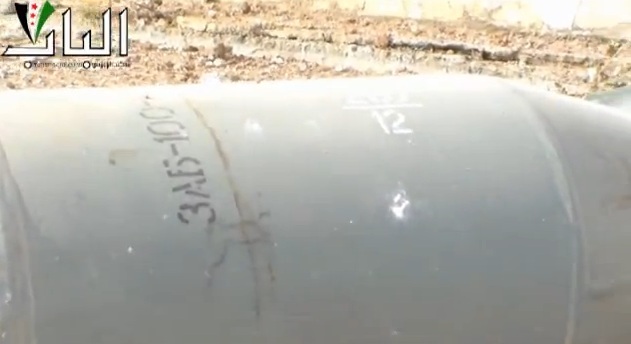 It's unclear what this substance is, but some people believe it's white phosphorous, but as yet there's been no evidence of how these bombs have been delivered. The text reads RBK-250, the cluster canister type, and ZAB-2.5. 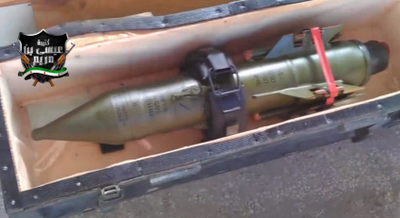 ZAB stands for zazhigatelnaya aviatsionnaya bomba, meaning "incendiary aircraft bomb". At the end of the video we also see what appears to be the scorched remains of one of the bomblets. As yet it's unclear the exact type of incendiary substances used with the ZAB-2.5 bomblets, so I cannot confirm this is white phosphorus. This clearly indicates that there's at least one incendiary cluster bomb in this, picture, and three if the tail fins belong to RBK-250 ZAB-2.5 cluster bombs. 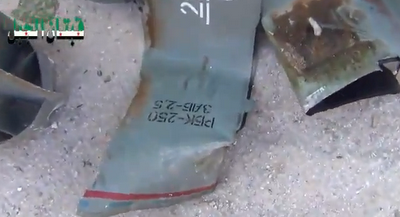 As with all cluster bombs we'll almost certainly see more evidence of cluster bomb canisters and unexploded bomblets, so expect more videos like this in the future. It's also interesting to note that this bomb appears shortly after the recent significant gains by the Syrian opposition across the country, much like cluster bombs began to appear after the Damascus-Idlib highway was captured near Maarrat al-Numan in Idlib. Update December 16th Nic Jenzen-Jones has put up a couple of great posts on his blog detailing the contents of the ZAB bomblets (a variety of thermite mixes), and a guide to telling the difference between white phosphorous and thermite munitions, both highly recommended reads. Way back, in the dim distant days before the Leveson (yes, there really was a time before Leveson...), Prime Minister David Cameron announced he was setting up a judge-led inquiry into press practices. Lord Justice Leveson was appointed to report to the Home Secretary and the Secretary of State for Culture, Media & Sport. The Prime Minister announced the Terms of Reference and appointment of “a panel of experts” to assist the Inquiry. He named each of them and observed (Hansard, 20 July 2011, column 918): “These people have been chosen not only for their expertise in the media, broadcasting, regulation and policing, but for their complete independence from the interested parties.” Ed Miliband too welcomed the Inquiry "and, indeed, the panel members chosen by the Prime Minister". Cameron praised cross-party agreement which had “worked well over the judicial inquiry, the panel, the terms of reference". (Hansard, 20 July 2011, column 918 onwards) So it is clear that the Assessors were Prime Ministerial appointments, in consultation with two Secretaries of State, and with cross-party agreement. They were not appointees in Leveson's gift. At that time, News International might have been the most apprehensive about the forthcoming Inquiry. Yet, arguably, Paul Dacre and Associated Newspapers Ltd (ANL) have proved the most challenging to Lord Justice Leveson. The Inquiry would hear evidence on ANL's past record with the Press Complaints Commission (PCC) when confronted with criticism - allegedly approximating string it out, object, delay, object some more, delay, go missing, too busy, fail to respond, object again. Leveson may well have reflected later that this obdurate strategy was mirrored in ANL's dealings with him - the self-same modus operandi in macrocosm. Leveson held an initial session and press conference to introduce himself, Assessors & Terms of Reference etc. He also drew attention to the Inquiries Act, and its provision that any objections on Assessor appointments could be made within 14 days. None were made. "Mr Mathieson of RPC repeated his position, identified in correspondence, that Associated Newspapers Ltd were minded to ask for core participant status but said that he was not in a position to do so in the absence of the Editor in Chief. On other issues, he was without instructions." Pre-evidence discussion Seminars were scheduled Mindful to include a range of experience and opinion, Leveson invited Paul Dacre to chair one of the Seminars: "I did ask him to participate. Unfortunately, on 6th October he cannot, and I am waiting to hear from him about the 12th, I understand." ANL wrote to Leveson, questioning the role and remit of the Assessor function, and challenging three of the six Assessors - Sir David Bell (here), George Jones (here), and Elinor Goodman (here). LORD JUSTICE LEVESON: The letters didn't quite read like that. Leveson made a salient point about ANL's argument that long experience of working with tabloids should be the prime criterion for balance of Assessors. If so, he suggested, it "would have been open to them (the Ministers) or to me to appoint, for example, Mr Mulcaire. He has expertise." (ANL Oral Arguments) Far from being swatted away dismissively, Leveson mustered the patience of a saint to give ANL's objections due consideration. Who can forget the interminable arguments in Court 73 twixt ANL and Mr Sherborne..? Leveson held a closed session with Core Participant counsel to discuss the general treatment of Operation Motorman materials. A consensus was reached that there was prima facie evidence of newspaper 'bulk users' illegalities. On condition of that collective consensus, Leveson proposed not to make the Motorman files public. ...to micromanage the conduct of the Inquiry by the Chairman... (I) refuse this application for judicial review. For the future,...protocol will be matters of detailed consideration for him, which should not foreseeably give rise to further requests for judicial interference. Mr Justice Sweeney: I agree. Mrs Justice Sharp: I also agree. Dacre's first appearance. Duly sworn-in, Leveson welcomed him: "Mr Dacre, I thank you, as I've thanked the editors of other newspapers who have allowed me to visit their newsrooms. I know you weren't there at the time but I'm grateful to you for allowing me to do so"
LORD JUSTICE LEVESON: We, of course, as you know, fitted in to Mr Dacre's timetable.... We WILL find some short period of time for this to be the subject of further evidence and we shall do that this week. And there it is. MR CAPLAN: I have no idea of Mr Dacre's whereabouts. LORD JUSTICE LEVESON: Mr Caplan, I'm very sorry. I know that Mr Dacre is busy. We have worked very hard to fit ourselves around his commitments. I cannot believe that in the next three days it is not possible to find a few minutes. We shall fit ourselves around him to such extent as we can but I beg you not to ask me to go further. Required to give that encore appearance (and clearly there grudgingly), yet another Dacre robust defence was prompted re Grant's "mendacious smears" - and a testy 11 page Supplemental Statement. ANL's counsel wrote to the Inquiry and, arguably, reneged on the consensus understood to be have been reached that the Motorman files demonstrated prima facie offences by press journalists. The Mail splashed its story alleging that Leveson had threatened to resign, was stifling free speech, and had clashed with Michael Gove's right-minded defence of press liberty. (1) Whether it is open to the Chairman to express concerns based on suspicion? (2) If so, in what circumstances, including, whether the grounds giving rise to the suspicion must be reasonable grounds or whether a lower standard of proof is acceptable, having regard to the duty of fairness? (3) Whether it is fair or appropriate when dealing with allegations of a criminal or quasi-criminal nature for the Chairman to state that he finds such allegations proved on the civil standard? Leveson's measured response, via written Ruling - addressed solely to ANL - was that he considered "it would not be appropriate to reach a conclusion about the Whittamore material that one of the most significant core participants (and one of the largest users of Mr Whittamore’s services) wished to challenge without deploying that evidence in public" (p8) So, Leveson was being very clear that he could and would put selected Motorman evidence into the public domain. As just ANL were recanting, he was prepared to arrange that only Motorman files exclusively linked to ANL titles would be made public. To reinforce the point, he was happy to order the necessary additional public Hearings in August. It did not sound as though Leveson was making an empty threat. Lord Justice Leveson and Mr Jay QC must have given sighs of relief.... prematurely. ANL also remains concerned that one of the Assessors who will be assisting the Chairman in his task is the former chairman of the Media Standards Trust, whose proposals for regulation - opposed by ANL and other publishers - include a proposed regulatory "backstop"
23rd July 2012Future Directions Ruling (here). Amongst other observations, Leveson returned to Operation Motorman. One outstanding issue he identified was "concerning the attitude of Associated Newspapers Ltd to the evidence revealed in the documentation seized from the private detective Steve Whittamore." He reported back publicly ANL's letter apologising for any misunderstanding on the Motorman evidence. Leveson also reminded that Mr Sherborne (Counsel for Core Participant Victims) was in the process of collating information on journalists named in the Motorman files who were still in continuous employment with the relevant titles. This exercice was to determine if those journalists had been rewarded by promotion or had perhaps retained data obtained from Whittamore. Once presented, Leveson required responses from the newspapers by 10th September. at time of writing, only one of those responses has been made public on the Inquiry web site - from ANL. Two days before the deadline, ANL sent the Inquiry 'Witness Statement from ANL re Steve Whittamore data'. It suggested that the Inquiry misunderstood the organic, perhaps haphazard, nature of working journalists collection and retention of people's personal data that they procured. ANL considered it disproportionate to search for and collate this "low grade" personal information, failed to name any journalists, and said they did not realise that Leveson actually required a response to his request made to Dacre as the Inquiry team had omitted to remind them. What could have provoked Dacre's itchy trigger finger? Well, there is one thing left out of our timeline as we don't know the 'if' or 'when'. It is a requirement that Lord Justice Leveson write, giving notice and inviting response, to anyone he intends to criticise in his Final Report. Hmmmm.... could it be that Dacre's Mail have had a Section 13 letter from Lord Justice Leveson? Rebel fighters took control of the 46th regiment in the western suburb of Aleppo, the last bastion of regime forces in the area and the biggest military base where its artillery and tanks used to bombard the surrounding towns and villages as well as the city of Aleppo. The base also was the main reinforcement’s source to regime forces fighting in Aleppo city. The rebels acquired more than ten military tanks and a number of rocket launchers, heavy artillery in addition to a big quantity of arms and ammunition. 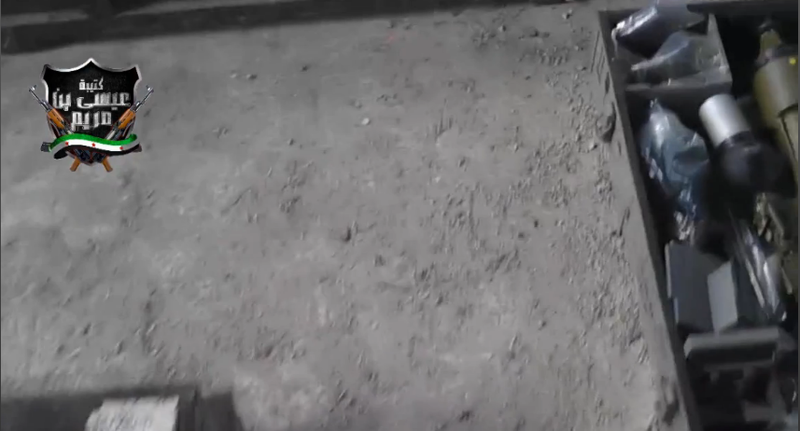 Several Youtube channels have been posting footage from the battle, as well as footage of what was captured, including atareb mohrara, atarebintoheart, freenorthernsyria, and atarebsyfree2012, and from those channels we can see a great deal of equipment was looted. In the below video we briefly see a BTR-60 in the background, along with what appears to be the T-55 shown towing D-30 in the first video, which can be seen clearly in this second video of the scene shot from behind the tank. 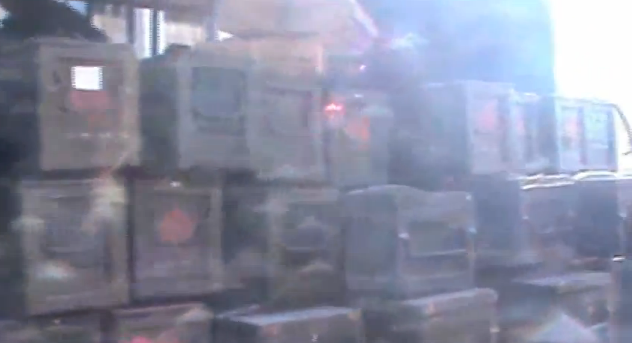 It appears that the stack of crates it's in, and the one behind it, are all the same kind of crate, matching the crates seen in the video of SA-24s and SA-16s captured in the Bala Air Defense Base in East Ghouta, outside of Damascus. 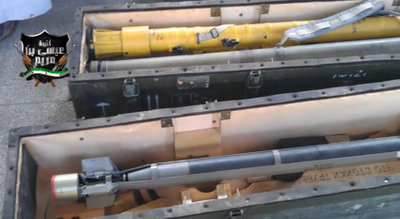 It should be noted that as with many surface to air missile systems captured by the opposition it appears there are no gripstocks, which are required for the operation of the missile systems alongside the battery and missile tube. 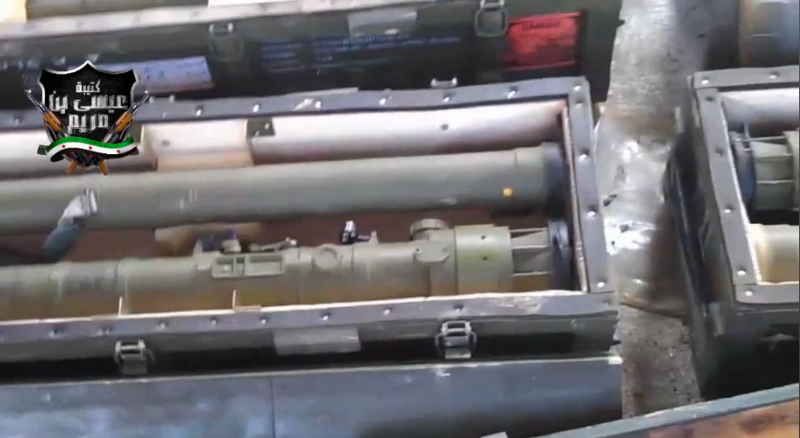 It appears that the Syrian opposition has managed to capture a large amount of heavy weapons with plenty of ammo in this attack, and we may see in coming days these weapons in action around Aleppo. Here are some key frames from the video that provides more details on what has been captured. Thanks to Steve Zaloga and Matt Schroeder for additional information. 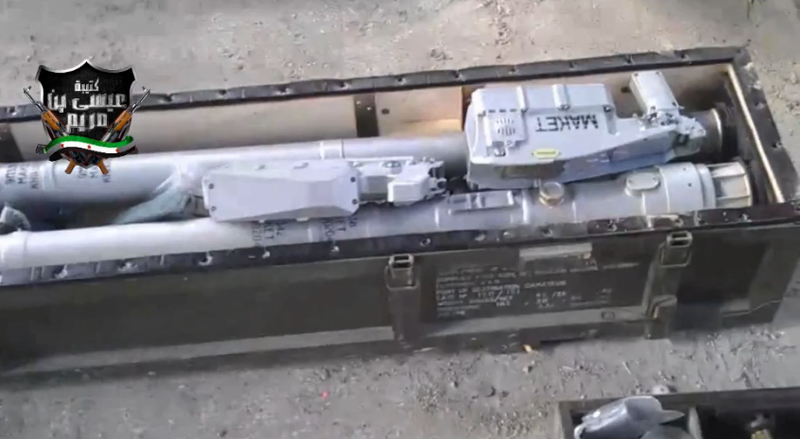 At the start of the video we see two crates, one holding a cutaway demonstration model of a missile, and a yellow demonstration model of the SA-24, both totally useless. The two crates above those crates hold a pair of live SA-24 missile tubes each. 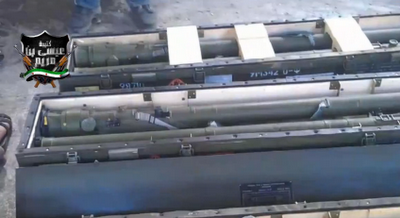 As the camera pans over we catch a glimpse of two more live SA-24 missile tubes on the right side of the screen. 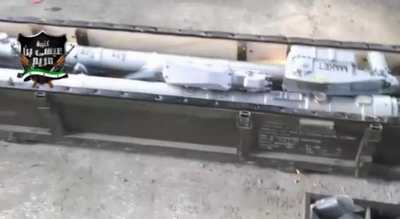 The camera than shows a AT-3 anti-tank missile. Before quickly panning over a pair of training SA-24s, again not much use to the Syrian opposition. The camera pans up to show two crates containing a pair of training SA-24s each, along with the grip stock, and just in the top left corner we spot another pair of live SA-24 missile tubes. The camera than quickly pans across, and for a brief moment on the right hand side of the screen we see what appears to be the edge of a live SA-16 missile tube, and more importantly what appears to be two spare SA-16 batteries. This means the only missing component for a complete SA-16 missile system is the grip-stock. Finally we have another pair of training SA-24s, followed by a massive amount of guns and other items. - 10 training or demonstration SA-24s. 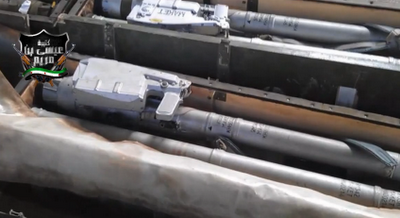 - 8 live SA-24 missile tubes. 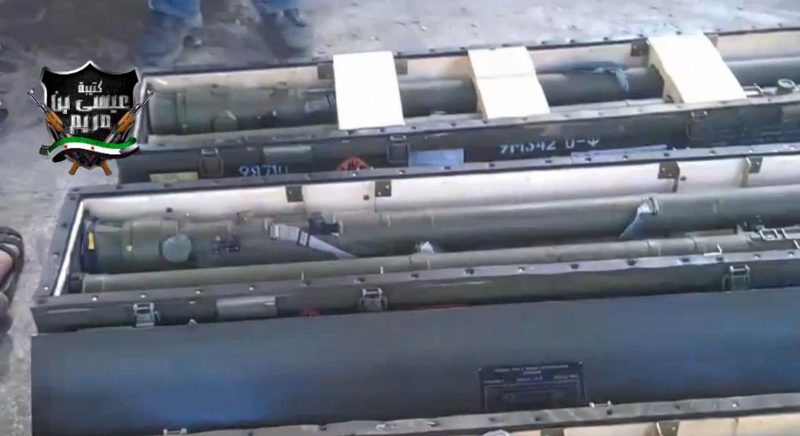 It's still unclear if live SA-16 or SA-24 grip-stocks have been captured, and training grip-stocks will not work with the live missile tubes. However, there were reports of a helicopter shot down in the area today, as well as video of a downed Hip Mi-8, although it's impossible to know if these events were related at this stage. However, on 31 October 2012 I will be retiring from the MPS and will be handing over responsibility for Operations Weeting, Elveden, Tuleta and all related investigations to DAC Stephen Kavanagh. In her 15 page statement, Akers has much to say of interest and includes (either explicitly or by omission) some developments in those intriguing 'related investigations' or 'sub-operations' are implied. The MET continue to liaise closely with the Crown Prosecution Service (CPS) on which charges are most appropriate and have the most chance of advancing successful prosecutions. Both MET and CPS will be acutely aware that each and every one of their charging decisions, and indeed their liaison process, will come under intense public scrutiny given the criticisms and consequences of the 2006-7 Operation Caryatid investigation into phone hacking by the (NOTW) News of the World's Clive Goodman and Glenn Mulcaire. Neither MET or CPS can afford any more reputational damage or suspicions of lack of backbone in confronting alleged offences by the press. Unsurprisingly then, Akers reveals that both individual and CORPORATE charges are under consideration. Operation Weeting: She sets out the known charges brought so far against 7 former NOTW journalists and executives, plus one non-journalist - see CPS statement here, with a provisional trial date set for September 2013. All eight are now on court bail. Also, of "the 17 arrested, six individuals have been released from police bail with no further action being taken. The remaining three individuals remain on police bail until November and December 2012. All three are on bail for offences relating to conspiracy to intercept communications." The 1 non-journalist above plus another non-journalist are also awaiting charging decisions in relation to associated money laundering allegations. Lastly, six others previously arrested under Weeting have been released from police bail with no further action to be taken. Weeting sub-investigation, Operation Sacha, has so far resulted in seven individuals charged with conspiracy to pervert the course of justice: "A hearing for defendants’ applications to dismiss is scheduled for 12-13 December 2012." One for the diary. The large proportion of Weeting police resources which had to be devoted to notifying possible victims is almost complete. Those number contacted is at present c. 2,500. The number of officers tasked is now being scaled back to 12, from a peak of 40. ...52 arrests consisting of 27 current or former journalists, six police officers, 12 current or former public officials and seven individuals who acted as conduits for corrupt payments. Files have been submitted to the CPS to advise on appropriate charges for three public officials and four journalists (current and former). One police officer has been charged with misconduct in public office and an offence under the Official Secrets Act 1989. The misconduct charge of this last individual has been reported as being in connection with Operation Varec. The last is intriguing - it means offences being considered must therefore include allegations which post-date 2010. Kelvin Mackenzie, amongst others, may belatedly realise that not all of the offences being considered jointly by MET and CPS have a public interest defence. Whilst re-acquainting themselves with the law, Kelvin and his ilk should note that the CPS have overhauled their guidance on what may be held to constitute 'public interest' in evaluating potential charges (see here) and provided a very handy guide to 'Criminal Offences Most Likely To Apply To Be Committed In Cases Affecting The Media', with maximum penalties spelt out clearly. Akers states that Operation Elvedon is pursuing evidence realting to News International, Daily Mirror, Sunday Mirror, Daily Star and Sunday Star. Express Newsgroup seem to be more amenable to MET investigation than Trinity Mirror does. is conducting an assessment of 142 complaints of data intrusion, including allegations of phone hacking, computer hacking and improper access to banking, medical and other personal records... a vast quantity of data across 70 storage devices is being searched for evidence to support or contradict allegations made... MPS counter corruption databases and relevant HOLMES databases are also being searched. Counter-corruption databases? Must be some joined up thinking going on. Seventeen individuals have so far been arrested, plus one interviewed under caution on suspicion of offences re the Computer Misuse Act, handling stolen goods (alleged to be mobile phones), and/or perverting the course of justice. And that's it for Tuleta.... A screechingly abrupt halt on page 10. But sharp-eyed readers will remember that Sue Akers submitted a 15 page witness statement. That's easily explained - page 11 REDACTED, page 12 REDACTED, page 13 REDACTED, page 14 REDACTED, and page 15 REDACTED. So, presumably for operational reasons and ongoing enquiries, Tuleta's sub-operation Kalmyk is off-limits (for background see here). As are any speculative links to any other past police investigations. Enjoy your retirement, DAC Akers - "Thank You & Goodbye". Over the past month we've seen large numbers of cluster bombs being dropped by the Syrian Air Force across Syria, leaving unexploded bomblets across the country. These are extremely unsafe and leave a long term UXO threat that one group in Syria has taken a rather novel approach to removing. In this following video filmed in Hama from one of the groups that make up Al-Farouq Brigade we see something quite remarkable, cluster bomblets being repurposed as warheads for DIY rockets. At the start of the video we see the bomblets being plucked from the ground, itself extremely dangerous, and the fuze being removed. We then see the rocket workshop with rows of these bomblets on the ground, all with the fuzes removed, and we're then shown a bomblet having it's tail fins removed, and replaced with a fitting that then allows it to be screwed into the rocket. A newly manufactured fuze is screwed into the bomlet/warhead, completing the rocket. 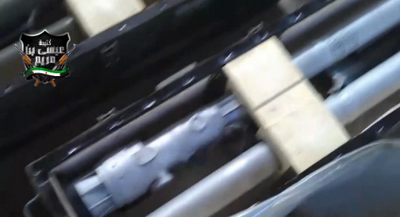 What this video shows isn't just simply the bomblets being used as warheads, but that there's an entire manufacturing process behind this, with new fuzes being made, the new fitting being designed and manufactured specifically for this task, and the rockets being designed around carrying the bomblets as a warhead. It really shows how sophisticated the manufacturing process for making these DIY weapons has become. Thanks to @HamaEcho for the video. Thanks to @troublejee for pointing out this post on Jihadist forum showing a rather interesting detail from a recent truck bomb attack executed by Jabhat al-Nusra. The post details an attack that took place using what they claim was a 3.5 tonne truck bomb, claiming to have killed 200 men and injuring many more. It's impossible to verify these claims, but I believe it relates to this report from Hama where 50 government soldiers were reportedly killed. 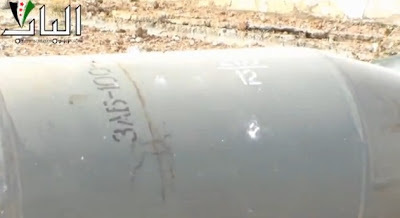 This shows the payload of the bomb, fairly typical lengths of metal tubes filled with explosives, as seen in other examples of truck bombs, but what I find very interesting is what's between some of them. Update November 16th Video footage has now been posted showing the SA-24 missiles described in this post, a detailed analysis of which can be found here. 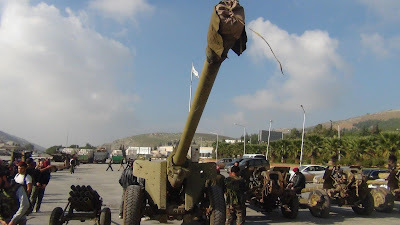 During the conflict in Syria a great deal of attention has been paid to SA-7 shoulder mounted surface to air missiles, but these are not the only type of shoulder mounted surface to air missiles in the hands of the Syrian military. Currently there's very little other information about the equipment captured, with no indication of the number of systems captured, and while it appears the battery is present it's unclear if the grip stock is also present. 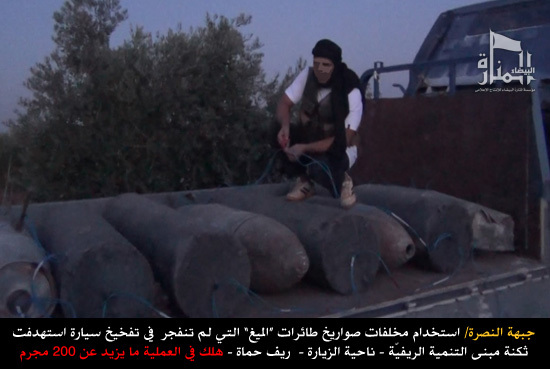 It's also been pointed out to me it appears to be the same man holding both missile systems. Update November 14th Thanks to @penym2 who has noted that the word on the gripstock of the SA-24 might be "MAKET", the Russian word for mock-up, although it's not possible to be 100% sure due to the quality of the photograph. AFter some research I found out that they were captured from Bala Air Defense Base near Mleiha town of Damascus Suburbs in Eastern Ghouta (Not Babla) by Ansar al-Islam as they said in a statement they issued on their Facebook page. When a country buys a MANPADS system, they get a standard package which includes several different types of training missiles. One type is a simple, non-functional cut-away dummy which is used to train operators on the basic construction of the weapon. They also get some non-functional models which are used for very simple training (pointing, etc.) The most elaborate type is a functional trainer which operates like the real thing and has a functioning seeker (but not a warhead or rocket motor) so that the trainee can understand what happens when they operate the real thing. The most elaborate type is a trainer that hooks into a desk-top computer simulator where the computer can be used to generate targets that are viewed on a small video device attached to the gripstock. I can’t tell from your photo, but it would seem to be one of the functional trainers, and not a simple dummy. 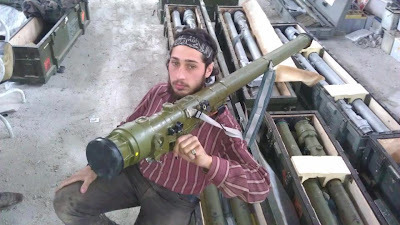 On these MANPADS, the gripstock (the lower section with the trigger, thermal battery and electronic package) is reusable, while the missile in its launch tube/transport tube, and the thermal battery are replaced for each launch. BTW, the Russian word Maket is borrowed from the French (maquette) and means “Model” rather than mock-up. Maket is painted on Russian training weapons so that troops don’t confuse them with the real thing. Likewise, they are often painted in a different color (such as silver) for the same reason. I have no specific details on what Syria has purchased in recent years. The Russians do not usually list their sales on the UN Arms Register, or if they do, it is limited to some very generic data (160 missiles, vs. 160 Igla-S, etc). The fact that the Syrians have the gripstock trainer strongly suggests that they got it as part of a package with the functional weapons. This page claims that they were captured by the Jesus son of Mary Battalion at the above mentioned Bala Air Defense Base. It should be noted without gripstocks and batteries these missiles are useless, and neither of them are pictured.